Hi friends! This is Ashley to share a card with you today. I'm really enjoying the Sunday Afternoon Kit! Have you purchased yours yet? I think there's a couple left. Hurry, hurry! Here's the card I made for today. I found this rainbow paper in the paper pack and I'm in LOVE! A lovely textured rainbow in soft colors? Swoon! I wanted to make a card that highlighted this pretty paper but wasn't too plain. 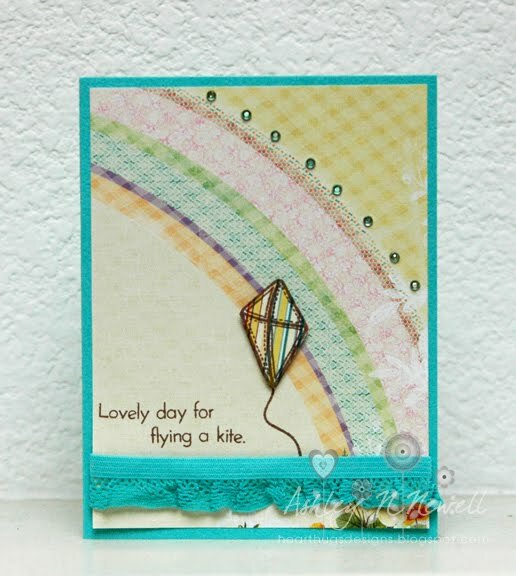 I stamped and paper pieced the kite, added the sentiment, a little trim, and some of the bling. Simple, but not TOO simple I think. this is so cute and pretty..
Adorable card! Love the aqua base w/the fab Webster's Pages petite paper and trim! Gorgeous! Adorable ashley! I love that rainbow paper too.